In electronics we usually deal with low voltage DC (Direct Current). 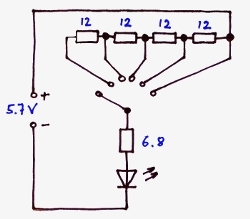 Supply voltages between 5 V and 24 VDC are common. Very often electronic circuits are designed for 12 V.
Supply cable in electrical installation are called phase (P) and neutral (N). 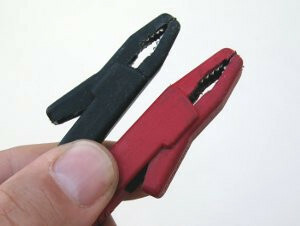 In DC the two supply cables are plus (+) (red) and minus (-) (black). In general minus is the common connection. Often it is grounded and connected to the metal housing of the equipment. In order to run such a circuit on mains voltage a power supply is needed. The power supply converts the high voltage (e.g. 230 V) mains AC (Alternating Current) into low voltage DC, for example: 230 VAC → 12 VDC. 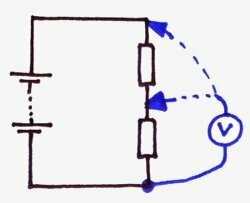 AC voltages can be transformed (making a voltage smaller or bigger) by means of a transformer without much losses. A powerless transformation of a DC voltage is not that easy. An AC voltage can also easily converted into a DC voltage by a rectifier. The other way round, converting a DC voltage into an AC voltage is also not that easy. The voltage V is measured in V (Volt). Electronic circuits usually run on DC. A battery is a typical DC power source. A battery is a connection of several single (battery) cells. The voltage can be measured with a voltmeter or a multimeter which includes a voltmeter. Digital voltmeters are easier to read but not necessarily more accurate. Only a calibrated voltmeter is precise, no matter if it is analogue or digital, cheap or expensive. Clamp and tips for measuring voltages. The measurement current through the voltmeter is extremely small so that the measurement leads can be thin and the the tips or clamps small. Because an existing voltage is a condition for an electric circuit, the first measurement in a defective circuit is always the checking of the operating voltage. An electric circuit consists of a voltage source and a load. 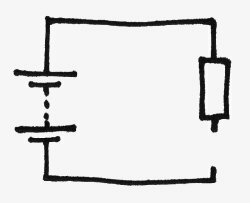 If the circuit is closed a current can flow. 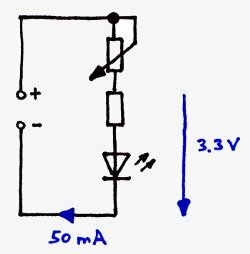 Simple circuit with voltage source and a light bulb. The battery delivers the voltage V to the bulb. A current I can flow. The current depends on the voltage and the resistance R of the bulb. Here the equivalent circuit with a resistor. The voltage of the resistor is measured across the resistor. The voltage of the power supply is measured across the power supply. In this case the voltage across the resistor and the voltage of the supply supply is the same. The first condition for a current is an existing voltage, second the closed circuit. The current in a closed circuit is everywhere the same and can be measured everywhere. Is the voltage DC also the current is DC. 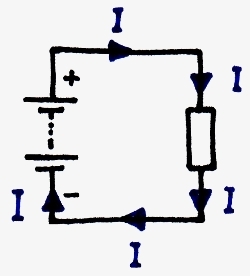 In a simple circuit the current is everywhere the same. The current I is measured in A or mA (Ampere). The current can be measured with an ammeter which is always integrated in a multimeter. Compare to voltmeters the quality of the leads, the contacts and the clamps are import because the current of the whole circuit flows through the ammeter, the leads and connectors. The higher the current, the bigger the connectors, cable and clamps have to be. Appropriate clamps for measuring currents. A small voltage measurement clamp was used for current measurement. The high current destroyed the clamp. Tips and clamps for voltage measurement must not be used for current measurement. In electrical engineering clamp meters are common. The measurement happens contact-less through the electrical field around the conductor which depends on the current. Clamp meters are not very precise and can be only used for high currents. In electronics the measurement of the current through a resistor is not very common. Because the current depends on the voltage and the resistor, the current can be measured indirectly by the voltage across a resistor (Ohm's law). Every electrical or electronic device has a electrical resistance. 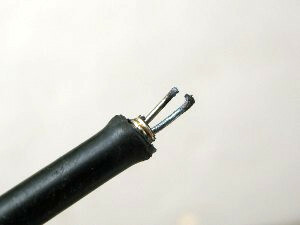 Even cable have resistances. Those cable resistances depends on the lengths, the diameter and the material of the cable. In electronic circuits resistors are found everywhere. They are available in different values, sizes and shapes. The resistance R is measured in Ω, kΩ or MΩ (Ohm). For troubleshooting electronics we are interested in the resistance of a resistor, the voltage across the resistor and the current through the resistor. The current can be determined by measuring the voltage across the resistor and the calculation with the resistance itself (I = VR / R). The resistance R has influence on the voltage across the resistor (VR) and the current through the resistor (IR). The resistor can be measured with an ohmmeter which is always integrated in a multimeter. For the measurement the resistor has to be disconnected from the circuit. Otherwise the rest of the circuit with its resistances influences the measurement result. The same applies when holding the resistor in hands. On one side the probe and the resistor connection wire can be touched but not on both sides because the body resistance will be in parallel with the resistor on test. Typically resistors get burned. They get high-ohmic (open connection) because of excessive current. This means: When a resistor got burned, there must be a reason for the higher current somewhere. Often it is a semiconductor (transistor, FET...) which got a short and produced the abnormal high current. If two of the three values are known, the third can be calculated. The values for the units are V, A and Ω.
kΩ can be used if the current is rated in mA. 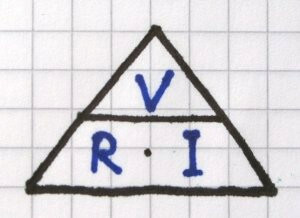 Imagine or draw a pyramid with the three values. The voltage V has to be up. If you now cover with a finger the value you are looking for, the correct constellation of the formula will be shown. 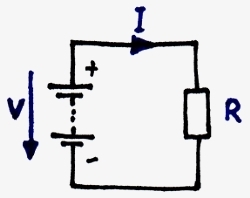 Example 1: A resistor at a power supply of 12 V creates 1 A. 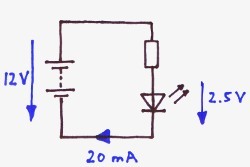 Example 2: What current creates a resistor of 120 Ω at the same power supply? Example 3: Through the same 120 Ω now flows only 41.7 mA. What has happened to the power supply? 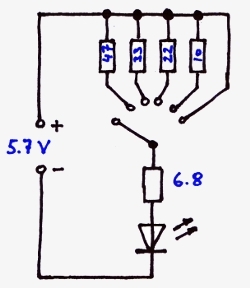 The voltage of the power supply has changed to 6 V.
In the following circuit the resistor is bridged. The resistor now is 0 and the current is maximum. The battery will get damaged and wires and battery can burn. To prevent this dangerous situation every power supply and every equipment has a fuse. A blown fuse has a reason. Do not only change the fuse. Find the reason for the high current first. 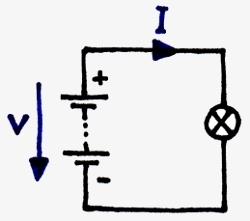 In an open circuit no current can flow and no current can create a voltage drop across the resistors. The voltage across the resistor is 0. The voltage in front of the resistor and behind is the same. 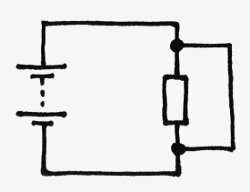 In a circuit with two or more resistors in series there is only one path for the current to flow: Through both resistors. The current through both resistors is the same. But because the resistors might be different the same current creates different voltage drops across the resistors. The voltage drops across the resistors are different. The voltage drops can be easily calculated by using Ohm's law. The current through both resistors is the same. The voltage drops across the resistors can be calculated when the resistor values are known. For the circuit above we know the overall voltage and the two resistors. In practice the minus probe of the voltmeter is connected to ground or common and remains there. Measurement are only made by using the plus probe of the multimeter. We are measuring against ground. Because the voltage drops are part of the overall power supply voltage can be easily calculated. The voltage V1 is the difference of the power supply voltage and V2. In other words: The voltage in front of a resistor minus the voltage behind the resistor makes the voltage drop across the resistor. In a parallel circuit all resistors are parallel to the voltage source. The voltage drops across the resistors are the same. But because the resistors might be different the currents through the resistors are not the same. The currents through the resistors are different. These currents can be easily calculated by using Ohm's law. The voltage across both resistors is the same. The currents through the resistors can be calculated when the resistor values are known. For the previous circuit we know the overall voltage and the two resistors. The total current is not known. To get the total current we have to calculate the 2 partial currents and add them. The total current is 80 mA. We can also calculate the total resistor and then the total current. Itotal = V / Rtotal Itotal = 12V / 150 Ω Itotal = 80 mA. Also here: The total current is 80 mA. A LED always needs a series resistor for limiting the current because LED do not work with an operating voltage like bulbs but with an operating current. A series resistor is a must for every LED application. In this example a 3mm LED with 20 mA at 2.5 V is used. The overall voltage is 12 V.
The current is everywhere the same and should be 20 mA. The voltage across the LED should be 2.5 V.
For calculating the value of the resistor we need the voltage drop across the resistor and the current through the resistor. 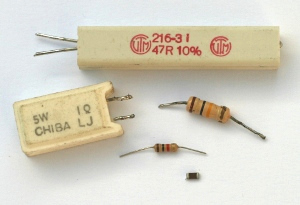 According to the E-12 series the next suitable resistor has 470 Ω. This small circuit can be used as a voltage indicator. It can show if a voltage exists or not. This is sometimes helpful in electronics when just have to be checked rather than exactly measured. In digital electronics for example high or low signals just have to be detected and a digital multimeter is often to slow for fast voltage changes. 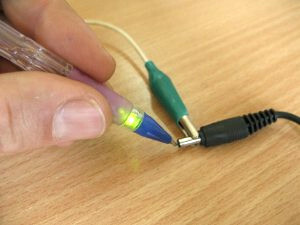 A simple LED with the series resistor mounted in an old ball pen is a great help for detecting this voltages or signals. The LED and the series resistor are integrated in the ball pen housing. 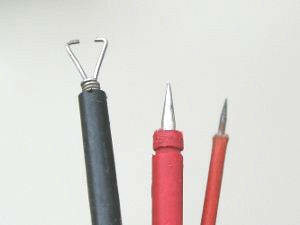 The old ball pen tip acts as a probe and a short cable with a clamp closes the circuit and is connected to ground. Such an indicator is also a cheap and good help in car repairs where only 12 V voltages have to be detected and traced. A current through a resistor or a load does not only creates a voltage drop but also power loss. This power loss is heat. The higher the voltage drop or the current the bigger the heat. A bigger resistor (in size, not in value) is able to transfer heat better to the surrounding air. It gets less hot. The power dissipation (wattage) depends on the size of the resistor. Beside the resistor value we also have to make sure that the resistor size or the power rating of the resistor is correct. Unfortunately these three formulas have also three variations each. That means 9 formulas have to be learned or the technique of converting a formula has to be known. If e.g. 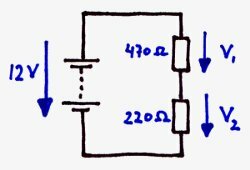 the resistor is given but not the current, we first calculate the current with Ohm's law and then take the power formula. 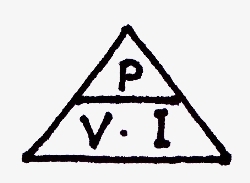 Also here a pyramid can be used – with P in the top. Example 1: Back to our LED and the series resistor. The current was 20 mA and the voltage across the resistor was 9.5 V.
A common ¼ W resistor can be used. Example 2: A light bulb for 230 V has 100 W.
How high is the current? Example 3: A heating element for 230 V has 353 Ω. What wattage has the heating element? The power supply of a microscope is defective and can not be repaired. The alternative can be a conversion from halogen bulb technology to a white LED system. A high power LED Luxeon Star has an integrated lens which focusses the light beam perfectly for this purpose. The LED has the following specifications: 350 mA at 3.42 V.
Problem: Can the charger be used and what series resistor has to be taken? The charger can deliver 700 mA. The LED only needs 350 mA. Yes, the charger can be used. resistor and the current through the resistor. According to the E-12 series the next suitable resistor has 6.8 Ω. 3. The resistor value is found, but will a standard ¼ W type be big enough? multiplied by the voltage across the resistor. A standard resistor is NOT big enough. We need a 1 W type. For a lot of examinations with the microscope, it is necessary to reduce the brightness of the light. For reducing the light we simply can add another resistor or better we make it variable and take a potentiometer. A pot in addition to the resistor-LED-combination reduces the brightness by reducing the current through the LED. The question now is: What is the value of the pot? I = 50 mA at a voltage of 3.3 V across the LED and the series resistor. For calculating the maximum value of the pot we need the voltage across the pot and the current through the pot. According to a catalogue the next available potentiometer has 47 Ω. Unfortunately such a small value is not very common and we might not get such a pot. But maybe it is not necessary to limit the brightness continuously. Maybe three or four different brightness steps are enough. In this case a rotary switch with different resistors is a good solution. If we have a position left we can even use it for switching off the light. A rotary switch with 6 positions gives 5 brightness steps and an off position. Turning the switch to the right gives more brightness (the resistors get smaller). To the very right no additional resistor is in use. The brightness is maximum and just limited by the 6.8 Ω resistor. Here the result is the same but the realisation is different. The resistors are added up as far we turn to the left.